It's almost like not needing windshield wipers! Well, maybe not quite, but it is a quick and easy way to prevent rain and snow from sticking to your vehicle's windshield, giving you clearer vision when Person Nature unleashes his and/or her fury on it! "It" is Rain-X Glass Treatment Wipes, a selection of which the company sent me, along with some Glass Cleaner Wipes with Anti-Fog. Both products resemble those wet wipe napkin thingies you can get to use on your hands or your baby's bum, but these ones are designed to be used on your vehicle's windows. Pennzoil-Quaker State, the maker of Rain-X, is marketing the products as a way to make sure your family’s drive is safer in winter conditions. They claim the Glass Treatment Wipes help improve visibility by preventing snow and sleet from sticking to your vehicle's glass and mirrors and by repelling rain – though it doesn't so much repel rain as cause it to run off quickly, which is nearly as good. We haven't had any winter since the Rain-X people sent me the stuff, but we've had plenty of rain – and after I used a Glass Treatment Wipe on the windshield of my old Infiniti Q45 I noticed its wipers did a much better job of getting rid of the water than they did before. It was almost as if the water were running off the windshield by itself, getting out of the way of the wipers, which then only had to act as a mopping up operation. Okay, that's an exaggeration, but not a big one: I love what this stuff does for the mighty Q. Visibility in the rain is improved noticeably. It doesn't work as well on my old Corolla, which probably has more to do with the relative condition of the cars' windshields than the quality of the Rain-X stuff, but even there the results were so encouraging that my wife tried applying a wipe to the outside of our kitchen window. And it does a pretty good job there, too. Using the wipes is like waxing a car, but easier: you apply the Rain-X wipe to the glass in a firm, circular motion, overlapping your circles. Then you buff out the milky haze residue the wipe leaves, using a dry cloth or paper towel. From that point onward, the universe will be at peace. 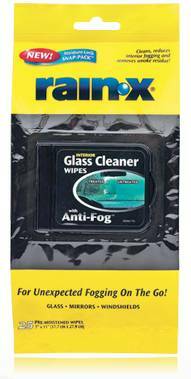 Glass Cleaner Wipes with Anti-Fog are meant to prevent your vehicle's interior glass and mirrors from fogging up (saving you from having to crack a window and wait for your HVAC system to take care of the stuff). The manufacturer suggests you leave a package of them in your trunk or glove compartment so they're at hand when things get steamy – which may be good news for pubescents planning to park on Lover's Lane. Of course you can be proactive and clean your windows before you leave, too…. The product is even claimed to remove smoke residue on your vehicle's glass and mirrors. I haven't tested that claim, but I remember from my smoking days just how hard that stuff is to get off with regular window cleaner, so if the Glass Cleaner Wipes work as advertised this could be a great selling point. 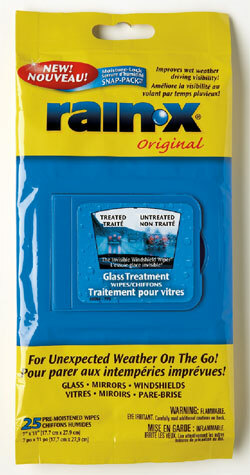 Incidentally, Rain-X is said to be safe for OEM tinted windows. Both products come in little re-sealable packages with 25 wipes inside. The wipes aren't the only products in the Rain-X arsenal, though they're the only ones I've tried so far. The company also makes the spray-applied Weatherbeater 2-in-1 Glass Cleaner and Rain Repellent, a selection of wiper blades, washes and waxes and some bug and tar products that would come in handy where I live (lots of bugs and constant road construction). The bug and tar stuff comes in an aerosol can and supposedly creates a skin of acrylic polymer to which all the gucky stuff sticks – then it supposedly washes right off, taking the gross little critters and other flotsam and jetsam with it. Rain-X says the product is safe for chrome, metal, paint and plastic. If you're like me and you never remember to be proactive with such strategies, Rain-X makes a Bug & Tar Pre-Wash Gel, which you apply from a spray bottle before going through the car wash, letting it soak for a bit before firing up the wand. Rain-X products range from about $2.50 for the glass treatment to about $22.00 for the longest Latitude windshield wiper blades.